Last week Valve finally decided to give buyers a little more power by allowing anyone to claim a refund on games within 14 days of purchase, provided you’ve played for no more than two hours. Whilst this is no doubt a great move for buyers, some developers are already struggling with the repercussions of such a system. No need for a refund with our guide to free Steam games. Qwiboo is the developer behind Beyond Gravity, a small indie game on Steam. The game’s main story is bite-sized, and can be finished in around an hour. It’s priced accordingly, too, at £1.59. But since Steam’s refund policy was introduced, it seems like players are taking advantage of the two-hour limit to play the game for free. Puppygames, developer of Revenge of the Titans, has seen a massive spike in players asking for money back since the policy went live. “55% refund rate on RoTT alone. Versus 5 refunds in 10 years direct,” the developer tweeted. 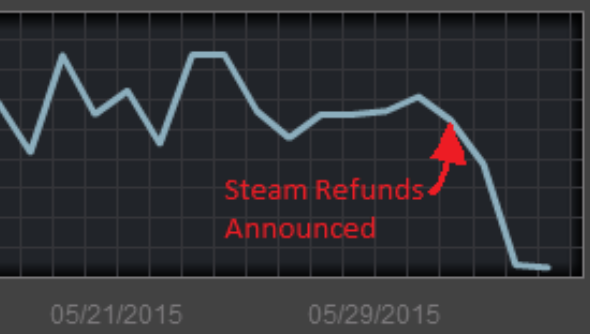 Puppygames also tweeted a graph (which can be seen in the header image) showing sales before and after the refund policy, and it’s a pretty damning story. Also coming forward with a similar story is RPG Tycoon developer Skatanic Studios, run solo by Matt Gambell. “Over the entirety of the 31 days of May, RPG Tycoon was refunded ONCE. In these first 7 days of June out of the 60 average units sold, over 20 of those have claimed a refund,” said Gambell on the Skatanic blog. With the situation like it is, Gambell worries this will push indies who were traditionally anti-DRM into a position where they feel like DRM is the only way to protect themselves. “Now I kind of want to add DRM to the game so that you can’t play it because you’ve actively revoked your rights to it… but doing that is against everything I believe in and is totally unfair for those that have paid for it and have paid for it to be DRM free,” he said. It’s a position Cliff Harris of Positech Games is worried about, too. If there’s anything we can agree on, it’s that DRM is a bad thing and none of us want it. While there’s no question that the refund policy is good for consumers, do you think Valve need to re-think the developer-end of the policy? Or should studios just accept that this is the best solution?